Good to know. It baffles me as to how I got into manual mode since my button has been absent since the debacle a couple of weeks ago. New part is on order along with a couple more HM boards from OSH that haven't shown up. They seem to be having issues. Anyways, onwards and upwards. I too have a UDS and the way I run my HM setup Fan, no more then 30% and I have a 3/4 ball valve at about half open or less. The way I tuned my UDS was to set it up without the HM and then get it up to temp. Once at temp and stable start closing the ball valve until the temp. starts dropping and put a mark on the valve at that point. Now when you put the HM on the UDS, it will raise the temp to set point and fairly stable. You may also want to up the fan speed more then the 30%, I have mine because I use a big 32cfm blower. The way to adjust the fan % is to watch what happens to the temp when the fan turns on. If it blows to much then you will see the temp go down and then when the fan turns off you will get a huge temp spike. 30% was the magic number for mine. Briskets on. I was planning on doing an overnight cook starting yesterday, but that didn't happen. So we're starting a hot and fast this morning. Edit: Cooks done. A little more detail. This was a brisket that started out around 15#'s, but by the time I trimmed it it was probably around 12 #. Done on a 18.5 WSM with Auber fan. Used briquettes for fuel. I ended up wrapping in butcher paper at around 165 F, but if I had to do it again I would wrap it a little sooner. Last edited by Alan Erickson; 10-27-2013 at 08:00 PM. 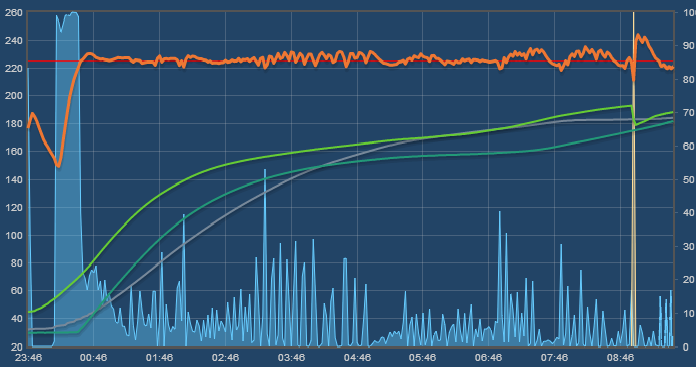 I am of the mind that we should join forces between the live heatermeter cooks and the post-cook graphs. It is really cool to watch the live cooks, but a good frame of reference to come back and look and see how things turned out once the machine has been turned off. In the most of un-scientific of fashions, today was the first attempt in the WSM with the nomex gaskets and let me tell you, it changed *everything*. A lot more air is needed to pump through as the thing is very tight now. Cook is a rack of pork ribs and a couple of pork spare-ribs. Paying mind not start with too big a fire, I let the HM start blowing on a piece of lit of vaseline-coated dryer lint in the middle of a pile of lump. Took quite a while, but I didn't care because I still had to buy and prepare the meat. Got everything up to speed and looking pretty good and had enough confidence to go run some errands. Had gotten about 15 miles away when the temps started dropping real fast. Still had the errands to run so I watched as they continued their steady decline. Came back and found that my air-burner manifold had come apart inside. (Still a prototype, so all the copper fittings were just being held together by friction. Had worked in the past, today something happened.) So, I pulled the middle and top off and tried to get the burner back together without lifting the charcoal grate. Nothing doing. So, repositioned the feeder tube that normally goes into the air-burner to blow directly onto the fire and messed with the PID settings until I got something somewhat stable. So, one hour of stability followed by two hours of wild temp changes and now back to stable. There's a Post your HeaterMeter graphs thread too, for after the party is over if that's what you mean.